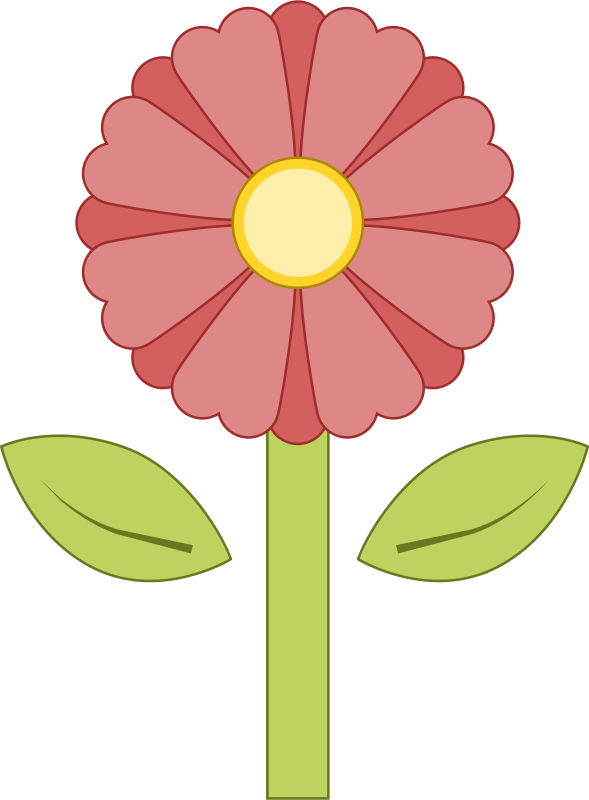 The Quiltzette - News from Cortez Quilt Company - Pattern Writing Contest Begins Today! Pattern writing contest launches today! Have you ever worked with a new pattern and said to yourself, “I could have designed this,” or maybe, “Who wrote this pattern and what were they thinking? !” Translating a vision for a beautiful project into text and images that someone else can follow might not be as simple as you think. Are you up for a late spring challenge? Great! Take part in our first pattern writing contest. Here’s the scoop. Design an original table runner that is at least 12” x 36” but not more than 18” x 48” in size. 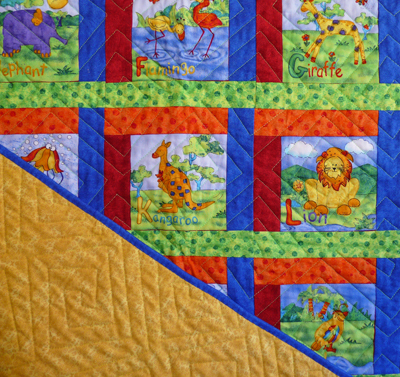 Your table runner must include piecing and may include applique. Your pattern must include step-by-step typed instructions and fabric requirements and may include photos/images. Enter your finished (quilted and bound) table runner and one copy of the pattern by June 30, 2014. Entry fee is $10 (waived if you purchase fabric for your project at CQC). All table runners entered will be on display at Cortez Quilt Company throughout the month of July. Everyone who comes into the shop during July will be encouraged to cast a vote for their favorite table runner. One entry per person during the month please. You may vote for your own entry (but just once!). On August 1, Cortez Quilt Company staff will tally the votes and announce the top three table runners based on the votes. Those three designers will each receive a $50 gift certificate to the shop. Then, CQC staff will make up each of the top three table runners following the pattern instructions and choose the grand prize winner. Judging criteria will be the aesthetic of the finished table runner and on how well the pattern is written. The grand prize winner will receive a gift basket full of quilting goodies plus the option to have their pattern published by Cortez Quilt Company and receive ongoing royalties based on pattern sales. Quilt shop employees/owners and individuals who have previously had a pattern published are not eligible to enter the contest. info@cortezquiltcompany.com to request a copy. Put "Pattern Contest" in the subject line. New fabric arrived yesterday . . .
We received this nice Southwest collection yesterday. The piece with the pots is really nice. Okay, they're all really nice! 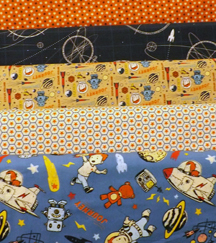 And this darling retro space-themed grouping would make an adorable quilt for any little boy or girl. One more time! Classmates is apparently the “must have” item around these parts because we keep getting requests for the class. Peggie Buckholts has agreed to teach it for us again. Yay! 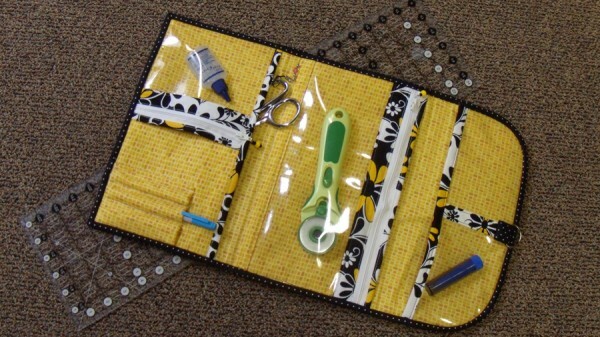 Make this handy carry-all for your sewing notions or to keep most anything organized. Uses clear vinyl, zippers, and one of our favorite new notions — Soft and Stable. Fun to make and use. Cyndi Foote will walk you through the proper way to add borders to your quilts so that they come out nice and square (not wonky! ), how to put on a sleeve for hanging a quilt, and how to properly sew on binding, including perfect corners and hand stitching so that your quilt will hold together for years to come and look great, too. Bring one small rectangle-shaped quilt block without any borders sewn on (about 16 x 24 inches) and fabric from your stash if you have it for the borders, sleeve, binding, and backing. Optional . . . make a quilt label using one of our new BERNINA embroidery machines! Join our Class Club to attend unlimited classes for a full year for only $225. If you love taking classes, do the math to see if this is a good deal for you. No card to carry for membership. We’ll keep track of your renewal date and all of the classes you take throughout the year. Join anytime! We’re now offering Class by Request – CBR for short. For four or more students, we’ll give classes in anything we usually teach on any day we don’t already have a class scheduled. CBR is ideal if you want to spend a day with friends (perhaps on a friend’s birthday?) sewing and learning something new. Regular class fees apply. Please call at least a couple of weeks in advance to schedule your private party. Classes must be paid for in full a the time of registration. Pay by cash, check, or credit card at the shop or by credit card over the phone. Store credit given for paid classes if you cancel and give 48 hours notice (otherwise, no credit). Refund or store credit (your choice) given for classes if we cancel due to lack of sign ups. Bring your sewing machine, manual, and basic sewing supplies (scissors, seam ripper, pins, etc.) to class. Bring lunch (we have a fridge and microwave) or order out from one of the many fine restaurants on Main Street. Parking on Main Street is restricted to two hours. As a courtesy to neighboring businesses (and so that you don’t get a ticket), please unload your machine and then park on North Street which is one block north, parallel to Main and a one-minute walk back to the shop. We have a wagon to transport your machine if you’d like to use it. If you need to make or take a phone call during class, please step outside or to the back of the store where it’s quiet. During the entire month of May, take advantage of ONE of following specials . . .
Be sure to ask us about 0% financing and our BERNINA trade-in program! If you're planning to attend the Four Corners Home & Garden Show at the Montezuma County Fairgrounds this weekend be sure to look for us. We'll be in booth #23. The show is open on Friday, May 2 from 12 noon until 5 p.m. and on Saturday, May 3 from 9 a.m. until 5 p.m. Hope to see you there!